Kitchens are the center of the home. They are where we eat, create, gather, and socialize. A well-designed kitchen fosters all those things, creating a space that is a comfortable, efficient go-to for family gatherings and daily interactions. So what types of features and designs are new home buyers in Bend looking for when building their new home? Here are five trends Greg Welch Construction customers are asking for. 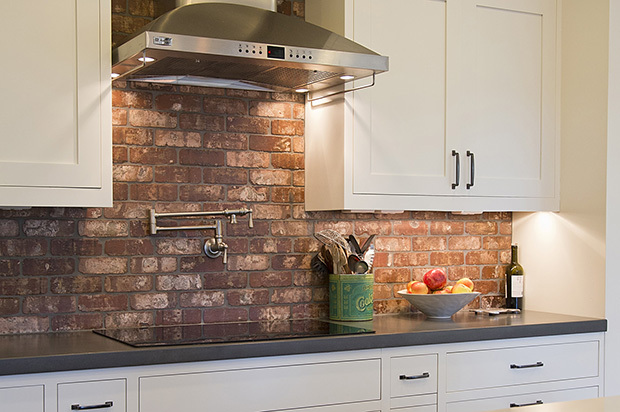 Subway tile – Yes! Brick – Sure! Bamboo – Why not? Copper – Heck Ya! Just about anything goes with back splashes these days. Long gone are the days of simply choosing from tile samples. Just about every combination of tile, wood, metal, or stone are being used to create unique back splashes that give the entire kitchen a fun and unique, custom feel! 2. A Pop of Color on Cabinetry. 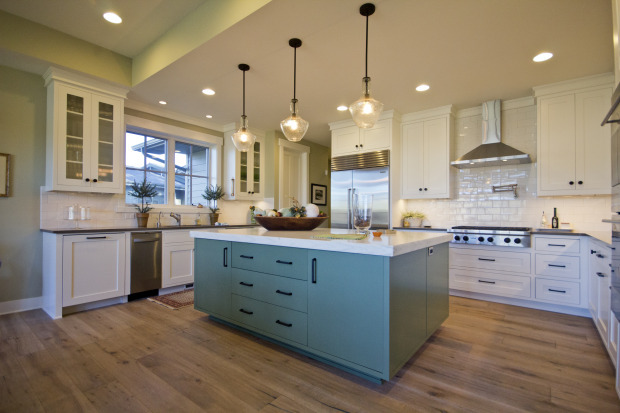 Far beyond just a light-colored island with dark-colored cabinets (or dark island with light cabinets), today’s designers are bringing character to the island with rich pops of color that complement, not just match, the surrounding kitchen cabinets and counter tops. How much color would you be willing to try? 3. Kitchen Islands That Do It All. 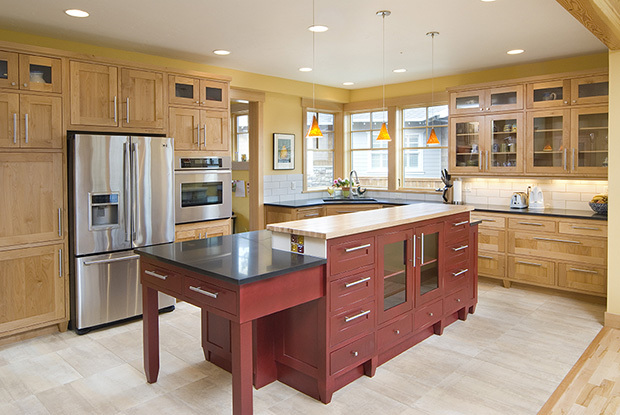 Whether you want your kitchen island installed with a pot rack, hood, wet bar, sink, dishwasher, wine fridge, or shelving for your cookbooks, today’s kitchen islands do double–sometimes triple–duty! 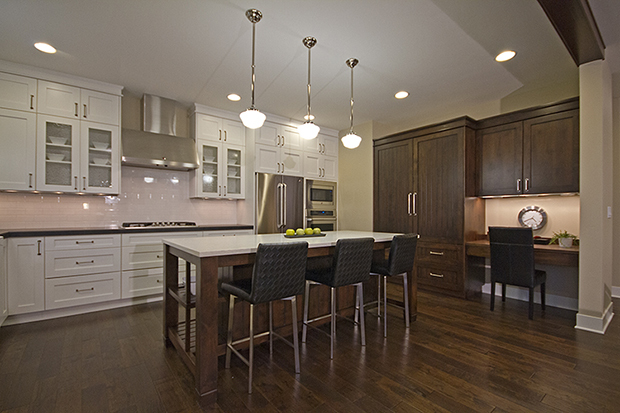 If you can imagine it, you can probably have it installed into your kitchen island. From a snack fridge for the kids, to a wine cooler for the parents, these kitchen islands are becoming the center of fun in the kitchen. 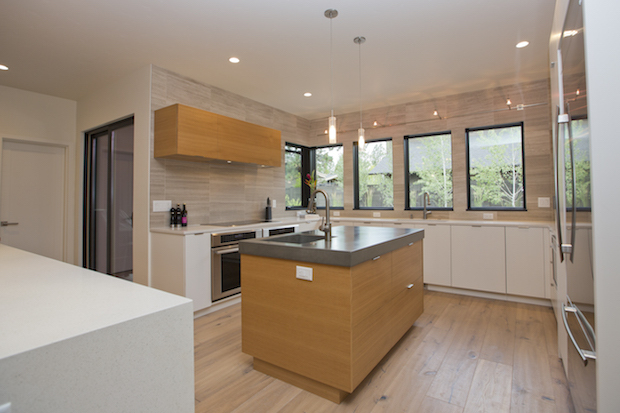 Many new homeowners are looking for a kitchen that’s more cohesive with the rest of the house. Instead of walls and rows of kitchen cabinets which block the flow and light through the kitchen, many new home buyers are opting instead to downsize the amount of cabinetry in the kitchen, replacing upper cabinets with shelves, glass doors, or windows that peer out to the beautiful high desert. 5. Mix and Match Cabinets. It’s not just about dark cabinets on the bottom, and light cabinets on the top anymore. New home buyers are mixing it up in all sorts of ways: different cabinet colors on different walls, shelves mixed with upper cabinets, different cabinet doors on the pantry, or different cabinet colors and designs on island cabinets. Today’s kitchen design is all about coordinating, not matching. This gives the home a custom, one-of-a-kind look.